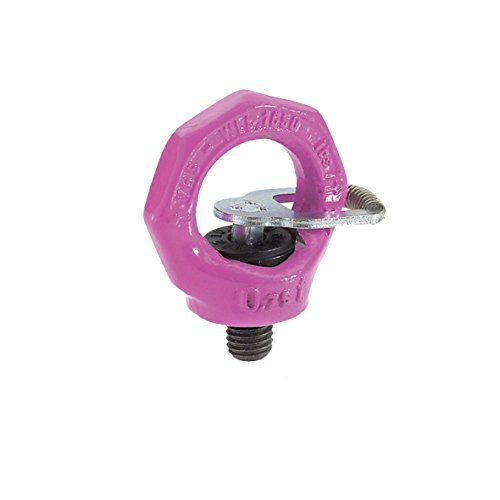 GN 581 swivel lifting eye bolts offer a high load carrying capacity and are tested to meet high safety standards. The nominal values for load capacity in the table are for the most disadvantageous loading conditions, and are also clearly marked on the ring. Unlike DIN 580 lifting eye bolts, the GN 581 lifting ring bolt is captivity mounted in the ring housing, yet rotates freely. The hexagon socket head bolt cannot be removed from the ring. The ring can be positioned in the direction of the load to make use of its optimum strength. The higher load bearing capacity as compared with DIN 580 lifting eye bolts permits the use of smaller mounting bolts. Hex key cover plate allows assembly without the need to use tools: inserting the hex key in the hexagon socket of the bolt allows the bolt to be turned by hand. GN 581 lifting eye bolts comply with Mechanical Engineering Directive 98 / 37 / CE and are BG tested.